Life with Lucie & Ella: I'm Finally Getting New Eyeglasses! I'm Finally Getting New Eyeglasses! I am the Queen of Procrastination when it comes to making doctor's appointments. Not sure why that is. It took me a year to find a new pediatrician when we moved here to Virginia. Thankfully, my kids are normally quite healthy so that was never an issue. I only got around to finding us a dentist when Ella needed some work done quickly. Yes, I need serious motivation to get in and make appointments with the doctor. So, when my last pair of contacts freaked out on my wedding anniversary, I realized that I needed to make an eye appointment ASAP. My glasses have had damaged coating and horrible scratches, for, oh, what seems like forever. I've survived with contacts, but those were starting to get uncomfortable and were about ready to be thrown into the trash. When we were at Walmart, I popped into Family Eyecare (the attached optometrist office) and made the earliest appointment that I could get. Today I finally went in to get an exam and new prescriptions. I'm so glad that I did! If you live in the Williamsburg area, I highly recommend Family Eyecare. I think it was probably one of the best eye exams I've had. Dr. Barley was wonderful and really took the time to answer my questions. Best of all, the price for the eye exam was cheaper by at least $25 than any other optometrist that I called. And now I have a new prescription so I can actually order glasses. Yahoo! Our eyeglass budget is very limited...but sadly, new eyeglasses are a necessity for me. So, I decided to give Warby Parker a try. 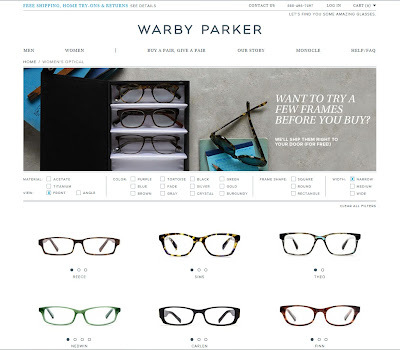 They sell prescription eyeglasses online for $95-$145 with polycarbonate and anti-scratch coated lenses included. Plus, for every pair purchased, they provide a pair for someone in need. How cool is that? They've also got a cool (and FREE) Home Try-On Program. 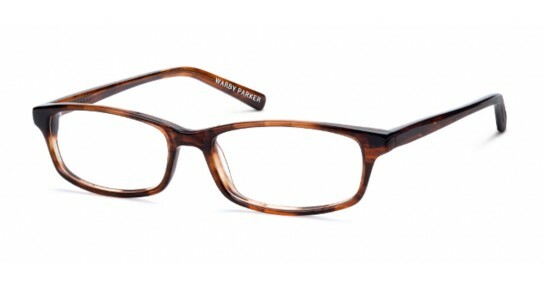 Reece (Whisky Tortoise) - The style of this pair was cool but they just weren't comfortable. They were too tight on my face and left indentions on my nose. Langston (Whisky Tortoise) - This pair felt too loose and appeared a little too large for my face. Leigh (Revolver Black Crystal) - This pair fit well but looked a bit too similar to my most recent pair. Nedwin (Cedar Tortoise) - By process of elimination, this pair was the "winner" of the bunch as the shape and size were both great. Reviews were mixed on the color as some people thought they were to "orangey." Nedwin (Cedar Tortoise) - Since this was the winner from the last round, I ordered it again so I could test it against the others to see which I liked best. Of course, I still got the "orangey" comments from people. Ellsworth (titanium frames in Bark) - Right after I ordered my first HTO, Warby Parker released its titanium line that costs $145 (compared to the plastic frames at $95). I thought it would be good to try a metal pair for comparison. The shape was okay, but honestly, I'm not a huge fan of nose pads. Not sure when that happened, but it has -- at least with these frames. My husband did like them and thought they looked a little more "professional," but honestly, I'm a stay-at-home / work-at-home mom so that didn't really sell me on them. Thompson (Whisky Tortoise) - The temples on these looked cool but were a little too large and interfered with my peripheral vision. Leigh (Sandalwood Matte) - My brother-in-law liked these the best, but my husband thought the color made my hair look gray. So yeah, hubby's opinion won out. I certainly don't want to be his gray-haired bride...at least not yet. I'd prefer to wait several more years for that to happen. Nedwin (Amber) - This pair is the winner! By far, it fits my face the best and the Amber color worked better for me than the Cedar Tortoise. So tonight since I have a prescription, I finally ordered glasses! Because I have a rather strong prescription, I upgraded to high index lenses for an additional $30 (a totally reasonable price). And, I used Shop at Home to save an additional 6% in cash back. So, when all is said and done, my glasses will have cost me $117.50 for plastic frames with high-index lenses and anti-scratch/anti-reflective coating. Not a bad deal. I'll report back when I get my new glasses. I can't wait!